Dr. Richard M. Myers is the President, Science Director, and a Faculty Investigator at HudsonAlpha Institute for Biotechnology. In addition, Rick is an adjunct faculty member in the Department of Genetics at the University of Alabama at Birmingham. He received is B.S. in biochemistry from the University of Alabama and his Ph.D. in biochemistry from the University of California, Berkeley. Afterwards, Rick conducted postdoctoral research at Harvard University. He served on the faculty at the University of California, San Francisco as well as at Stanford University where he contributed substantially to the efforts to sequence the human genome as part of the Human Genome Project. Rick accepted his current position at HudsonAlpha in 2008. He has received many awards and honors throughout his career including an Honorary Doctorate Degree from the University of Alabama, the Blount Initiative Award from the University of Alabama, the Pritzker Foundation Award from the University of Michigan, and the Darden Lecture Award from the University of Alabama. He has also been named a Fellow of the American Association for the Advancement of Science. Rick has joined us today to talk about his experiences in life and science. Rick enjoys spending time with his family, including his two adult children. One currently lives in Seattle and the other lives in London. In addition, Rick’s hobbies include cooking, gardening, and woodworking. At work, Rick balances being a scientist, running his research lab, and managing administrative responsibilities as head of a research institute. His research focuses on genetics and genomics. In particular, Rick aims to better understand how our genes and their expression contribute to our traits, health, and disease. He also examines how genes and gene expression can be regulated. Rick’s interest in science began with his fascination with space. When he was growing up in the 1950s-1960s, Rick collected every newspaper article and watched all the broadcast coverage related to the moon landing. However, Rick never considered a career in science because he didn’t think he fit the stereotypical characters of scientists in movies. He was convinced you had to be a nerdy genius to be a scientist. Rick’s parents were highly educated and held careers in pharmacy and nursing, so he knew he would go to college. When the time came, Rick majored in sociology and planned to work towards tackling the global issue of overpopulation. He added a minor in biology thinking it would be needed for his future endeavors. A course in chemistry was required, and the teacher of that course invited Rick to work in the lab over the summer. Rick agreed, and within a few weeks, he realized the thrill of the scientific process where researchers conduct experiments to answer questions and discover new things about the world. After this experience, Rick changed his major to biochemistry and continued along the path towards a career in research. Rick was a member of one of the first genome centers, and it was also one of the first genome centers funded by the National Institutes of Health. The group was doing really well, and they were excited to submit a renewal for their grant, but it was not selected for funding. Without funding, Rick would have to close down this great genome center with many fantastic people working there. However, after they heard the bad news, the Department of Energy approached them with an offer to work together on aspects of the Human Genome Project. Rick and his colleagues agreed, and they were able to make a substantial contribution to sequencing the first human genome. Recently, Rick, his research team, and their collaborators have been working on a project examining tumor genetics in pancreatic cancer. Using about 100 tumor specimens, they used their genetic tool chest to identify genes that were present in the tumors, but not present in healthy pancreas tissue. Unfortunately, these findings weren’t new, and they had been published previously by other groups. Rather than shelving the project and moving on, Rick’s group decided to use the dataset to answer other questions. They next investigated whether there were genetic differences in the tumors between people who died quickly of the cancer versus those who lived longer. They discovered a pronounced genetic signature that they reproduced in a public dataset. This is exciting because as soon as a patient is diagnosed, you can use their findings to know which kind of tumor a person has and tailor their treatment accordingly. In fact, they are now beginning a clinical trial with collaborators where their genomic data is being used to determine the treatment a patient will receive. In 1984, there was a small scientific meeting hosted by the Department of Energy (DOE) at a ski resort in Alta, Utah. Rick’s graduate advisor passed the opportunity on to him to be one of the 19 attendees of the conference. Though Rick doesn’t ski, and he was stricken with altitude sickness for most of the trip, he still had a fantastic time. The goal of the meeting was to figure out if they could determine the rate of mutations we are born with that our parents don’t have (germline mutation rate). The group concluded that the mutation rates were so low that they would have to sequence the entire human genome to figure it out. Everyone laughed when this was announced because it seemed ridiculous and impossible at the time. A few years later, the DOE announced they had to sequence the human genome. This meeting not only solidified Rick’s interest in doing research in this field, but it also started the discussions that led to the Human Genome Project. When he was in graduate school, Rick was always in the lab. He worked about 100 hours per week, but he loved it so it didn’t feel like work. Rick and his peers would close the lab doors and listen to loud music while they worked until about midnight. There were two students from England in the lab, and they brought in a dart board so they could all play darts during breaks. It was also a tradition for the whole group (including their advisor) to to out to dinner to a nearby family-style Chinese restaurant. All of the lab members would sit around a big table, and the food went quickly. If you weren’t aggressive about getting food on your plate, you were out of luck. Work hard. Know that graduate school and various careers in science are options for you. You don’t have to be a genius to be a scientist. Also, team science and collaboration are key. Don’t feel like you have to do everything yourself to be successful. Further, you don’t have to give up your humanity. You can be a good human being and a good scientist. For scientists, it is critical that we communicate what we do to the public and convey how it affects people’s everyday lives. Also, there are many paths to meaningful careers involving science, scientific knowledge, and/or the scientific method. For those pursuing research, it will be helpful to learn quantitative, analytical, and statistical skills early on since these skills are needed for dealing with large datasets. While a faculty member at Stanford University, Rick served as professor and chair in the department of genetics. Under his direction, the Stanford Human Genome Center contributed more than 10% of the data in the public Human Genome Project’s efforts to sequence the human genome. Rick joined the HudsonAlpha Institute for Biotechnology in 2008 as president and science director. He supplies the strategic oversight for the research enterprise at the Institute including sustaining a large, active laboratory. A native of Selma and Tuscaloosa, Alabama, and the son of a pharmacist, Rick brings 35 years experience in genetics and genomics to his position. 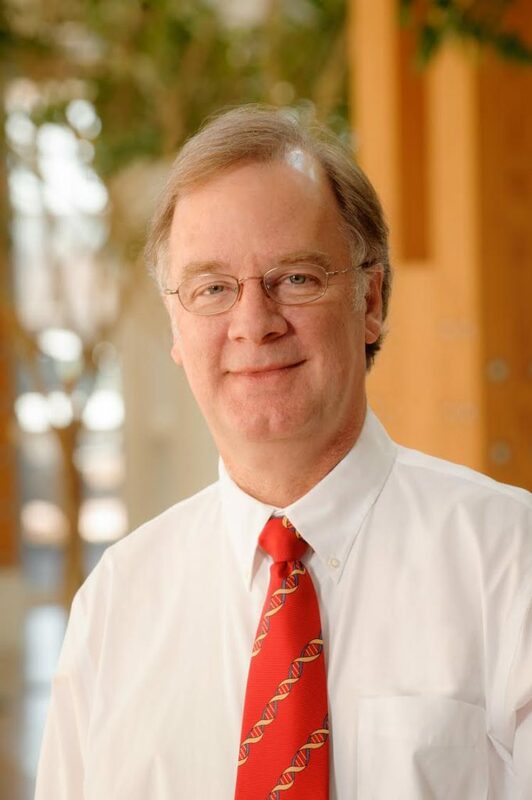 Rick’s lab, in collaborative relationships with other researchers at HudsonAlpha and elsewhere, studies the human genome with the goal of understanding how allelic variation and gene expression changes contribute to human traits, including diseases, behaviors, and other phenotypes. His group uses high-throughput genomic methods – including DNA sequencing, genotyping, chromatin immunoprecipitation, mRNA expression profiling, transcriptional promoter and DNA methylation measurements – as well as computational and statistical tools to identify, characterize, and understand the functional elements encoded in our genomes and how they work together at the molecular level in normal and pathological conditions. The lab sequences whole genomes, whole exomes, and targeted regions of the genome with ultrahigh-throughput DNA sequencing technologies to identify DNA sequence variants relevant to clinical and basic biological problems. Researchers in the Myers Lab integrate these functional genomics, epigenetic, and genetic data to understand how genomes are involved in cancer, brain disorders, ALS, children born with developmental disorders, autoimmune diseases, and other traits.